This manual on bats and their role in emerging infectious diseases in animals and humans underlines their important role in maintaining the delicate balance in ecosystems that support human, plant and animal life. 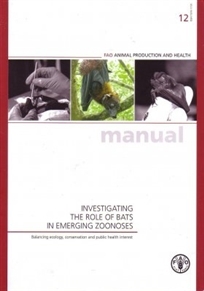 Investigating the Role of Bats in Emerging Zoonoses is a manual meant to be used by epidemiologists, wildlife officials, farmers, livestock veterinarians, zoologists, and any number of different professionals who might be coming into increased contact with bats. It is a hands-on reference to their history, biology, monitoring, and handling, especially amid growing evidence they can be a route for introduction of emerging diseases in livestock and humans.